The knit masters presented a collection with a color palette of navy, white, oxblood and black. There was a great emphasis on texture and the collection depicted some fit and flare silhouettes as we've come to expect from the Ohne Titel runway. 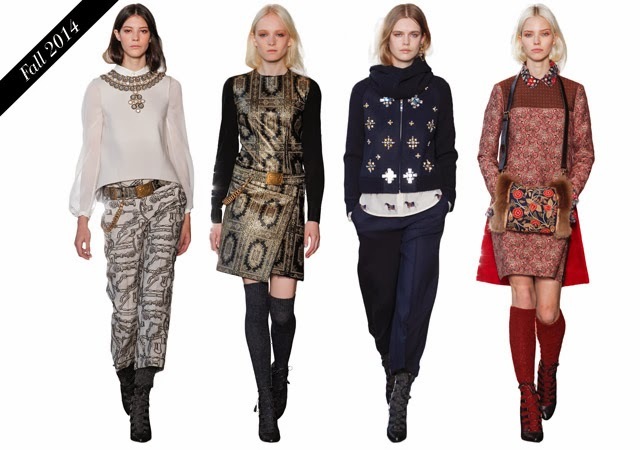 Tory Burch’s fall 2014 collection focuses on clean, strong silhouettes with bold embellishments. The wardrobe has a timeless quality that can be brought back to life at any time. The inspiration was drawn from the designer’s parents’ armor collection, whose subtle signs can be seen in the mixture of texture, brocade tapestry and floral. The collection has a royal air to it, and not so subtle medieval touches. The palette used is navy, oxblood, gold and gray, which comes across as a risky combination to work with but Tory Burch manages to recreate her classic wardrobe with a modern twist. I love the use of gold and grey together. I love the textures used on this line. The bold embellishments draw the eye in. I truly am coo coo for this wonderful bold line. Love the textures of this upcoming season, and wow, the Tory Burch designs are super-intricate and rich! I applaud her for her ability to build a brand empire from shoes and expand out into perfume, fashion, and beyond. All of those are beautiful statement pieces that would be the center of attention... gorgeous! These are really cute! I am going to have to try and copy some of these looks this Fall!